Waterloo – Wilfrid Laurier University researchers have found providing rent subsidies is a highly effective way of promoting housing stability for people who have experienced persistent homelessness, according to a new study conducted in the Region of Waterloo. 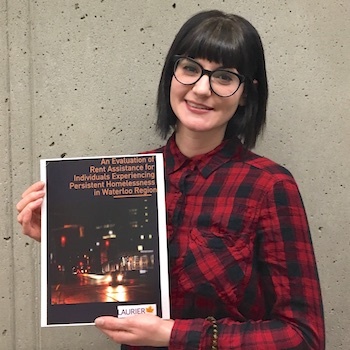 Courtney Pankratz, who recently finished her Master of Arts in Community Psychology under Laurier Professor Geoffrey Nelson, is the lead author of the report, An Evaluation of Rent Assistance for Individuals Experiencing Persistent Homelessness in Waterloo Region. Pankratz studied 26 people who received rent assistance through the Region and 25 who did not. She and peer community research assistants interviewed participants, all of whom had experienced persistent homelessness. Interviews took place in 2015/16, shortly before or soon after those receiving rent assistance moved into their new homes and again six months later. Not only did those receiving rent assistance end up spending much more time in their own apartments, they also improved more on quality-of-life measures than the group that did not receive rent assistance, said Pankratz. At the beginning of the study, some participants were living on the streets, while others were in shelters, transition homes or rooming houses in Kitchener, Waterloo or Cambridge. Few were in their own apartments. Many had mental health and/or addiction issues that made them difficult to house. Those with the longest history of homelessness were prioritized to receive rent assistance. Those who lived in apartments before the start of the study spent only an average of 11 per cent of their time there. After six months, they were spending 81 per cent of their days at home – a “huge jump,” Pankratz said. Meanwhile, those not receiving rent assistance were spending about 39 per cent of their time in their own homes at baseline. Six months later, they actually showed a decline in the proportion of days they spent in their own apartments – to 24 per cent. “I think the drop demonstrates that without having that extra financial support, it’s really hard for people to keep their housing. If somebody loses their job or if they have only temporary access to additional funding, when that isn’t available to them, their housing stability is going to drop,” said Pankratz. The study was based on the Housing First strategy, which aims to get people experiencing homelessness into housing as fast as possible, then work intensively with them on other issues to help them keep their housing. The approach has widely been shown to be effective, including through Nelson’s research. The funding for the rent assistance came from the Region of Waterloo as part of the provincial government's Investment in Affordable Housing for Ontario program. Since the study, the Region of Waterloo has received provincial funding for an additional 60 rent stipends, for a total of 100. Not all people receiving rent assistance participated in the study. “Without rent assistance you can’t really do a Housing First program,” said Pankratz.